Sony is attacking its rivals Canon, Nikon and Panasonic in the digital SLR market with a new offering – the DSLR-A700 – targeted at photo enthusiasts and serious photo hobbyists. Like the older A100 model, the new A700 also features image stabilization in the camera body itself and compatibility with most Minolta Maxxum mount lenses besides the Sony lenses. For the A700, Sony has developed a new BIONZ processing engine that’s optimized to process picture information at high speeds and reduce picture noise in the RAW data stage before final image compression and encoding. 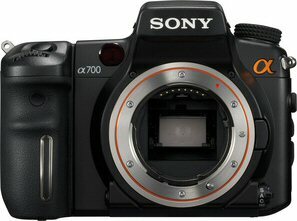 Priced at $1,400 (body only), the A700 and the two lenses are scheduled to be available in October. In spring 2008, Sony plans to offer a 70-300mm f4.5-5.6 SSM G telephoto lens with super sonic wave motor auto focus drive system.